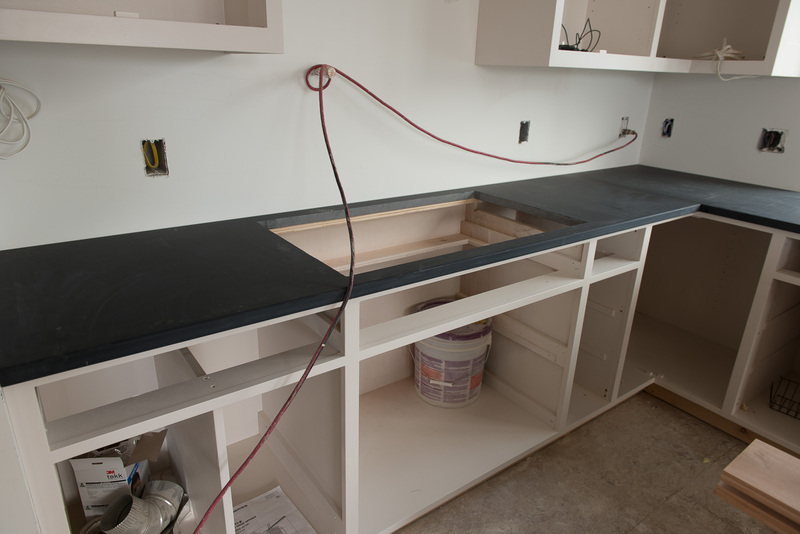 Slate counters, Linda and the mystery of polished Black Zimbabwe. Big day yesterday, but first a quick story. 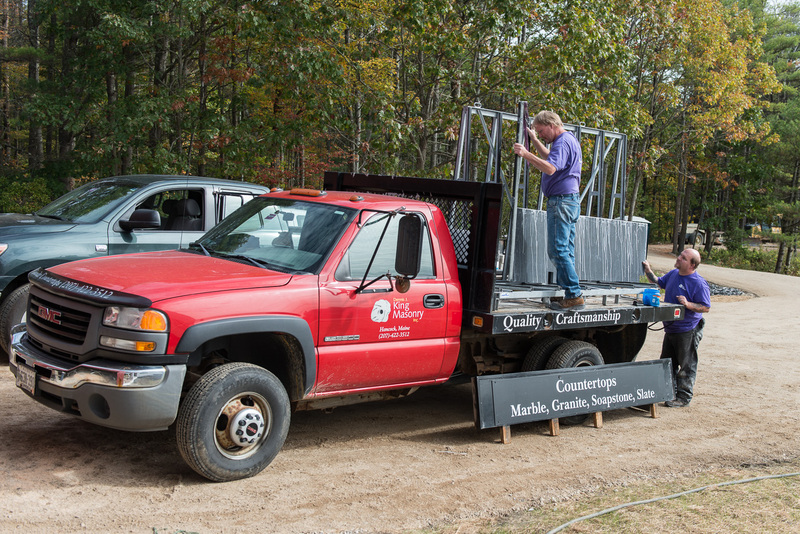 Years ago, we decided to upgrade our counters on Flying Point Road to granite. Our budget wouldn’t allow us to do the whole kitchen, so we tackled the sides first and pushed off the island for a couple of years. A very practical approach. Prudent. Fiscally responsible. No shut-downs required. Ultimately, a big boo-boo. 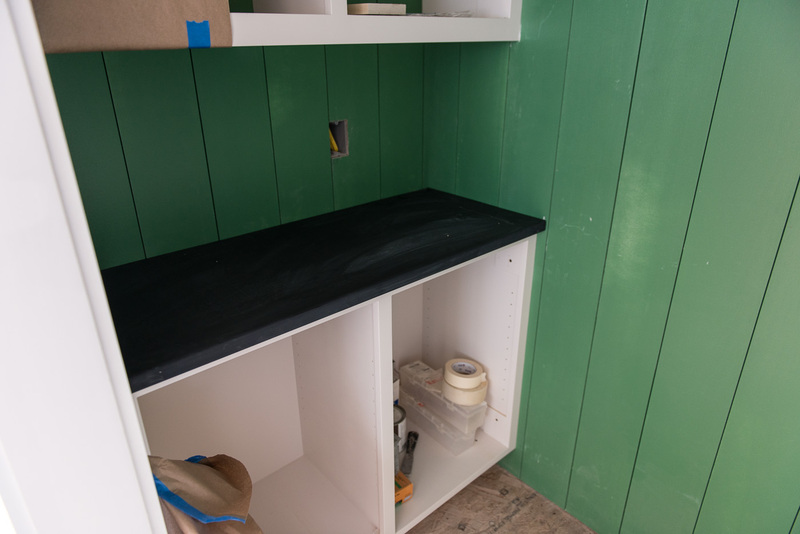 Because when it came time to do the island, we couldn’t match the original granite — specifically “polished Black Zimbabwe” that we had installed on the sides. The large Portland stone company that sold us the counters no longer carried it and were colossal jerks. The big home improvement centers couldn’t get it. We tried everywhere; finally resorting to sending out emails to random addresses that we found on Google. And that’s how we met Linda from Dennis J. King Masonry in Hancock — a tiny town just outside of Acadia National Park here in Maine. One afternoon, we got a reply to one of our emails with a simple “I can get that stone for you.” Awesome price. Incredibly pleasant. A couple quick reference checks later and a perfectly matched island was installed. So when it came time to do the counters on Dash Landing, we asked John to include them in the mix. And yesterday the Dennis J. King crew made the long drive to install all of our interior stonework. 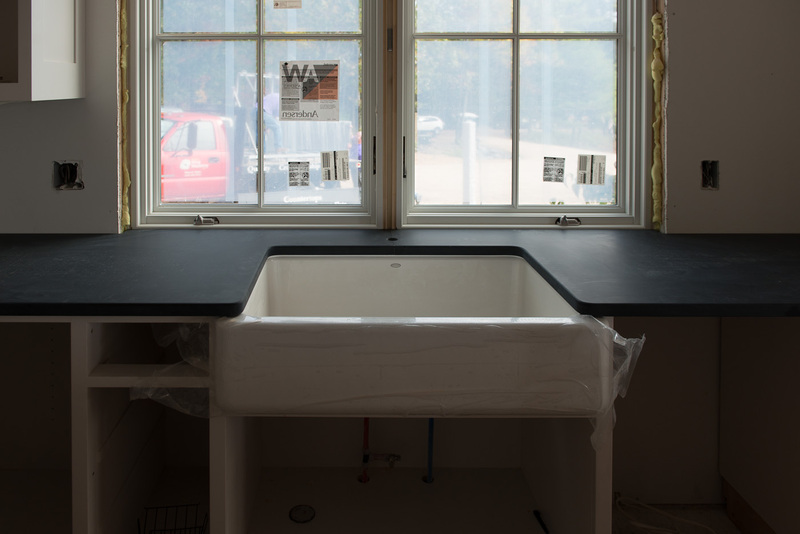 Originally we were just using them for the kitchen counters, pantry and fireplace surround, but by carefully cutting our slab, they were also able to squeeze out all four bathroom counters. 1 1/4″ inch of gorgeous black slate. 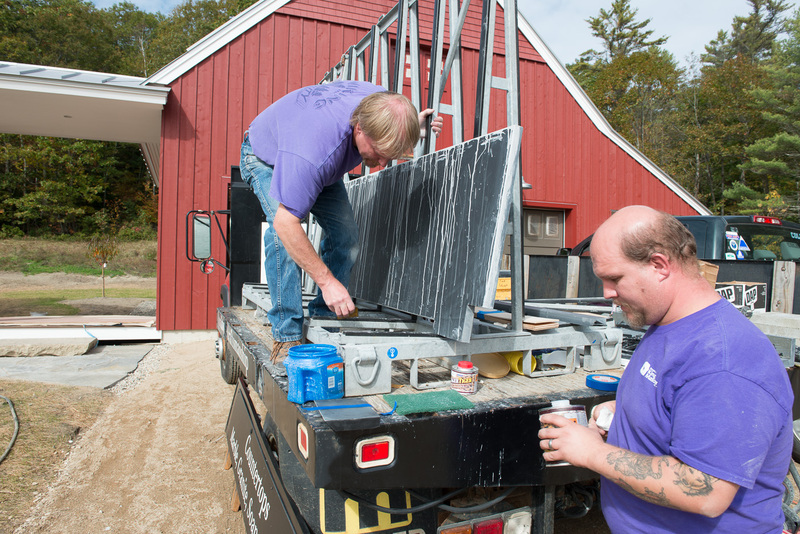 From template to install — seven days. More than fair price. 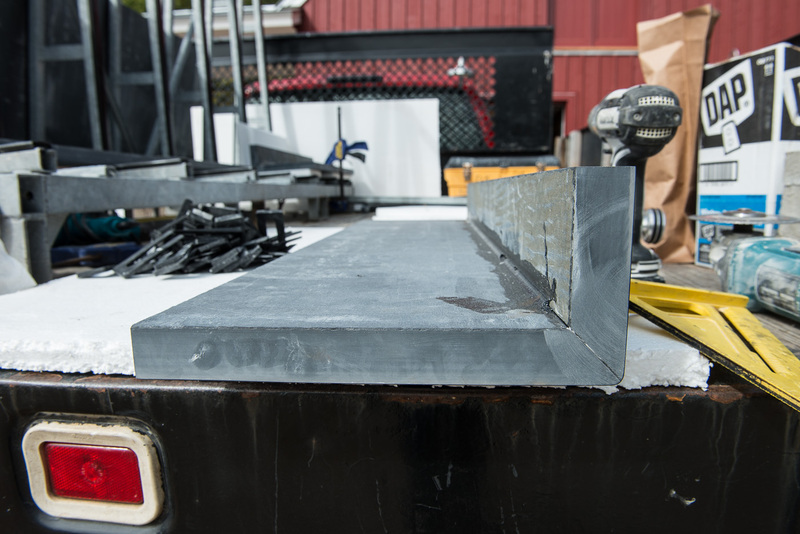 A few fabrication touches that defy description. And some of the nicest people imaginable. Farmers sink with the new counters. 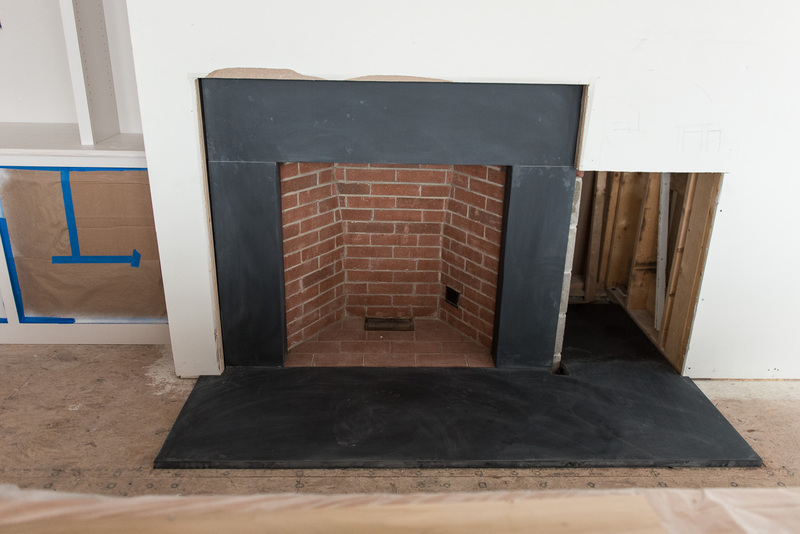 Prepping the fireplace hearth for install. Jeff estimated that this piece was roughly 250 lb. The right fireplace surround. The King folks needed a little “encouragement” to make this miter, but the end result is absolutely amazing. Fireplace. The mitering makes those surrounds look like they’re 4″ thick. They’ll now start the mantle and the opening on the side will become a small firewood / kindling box. 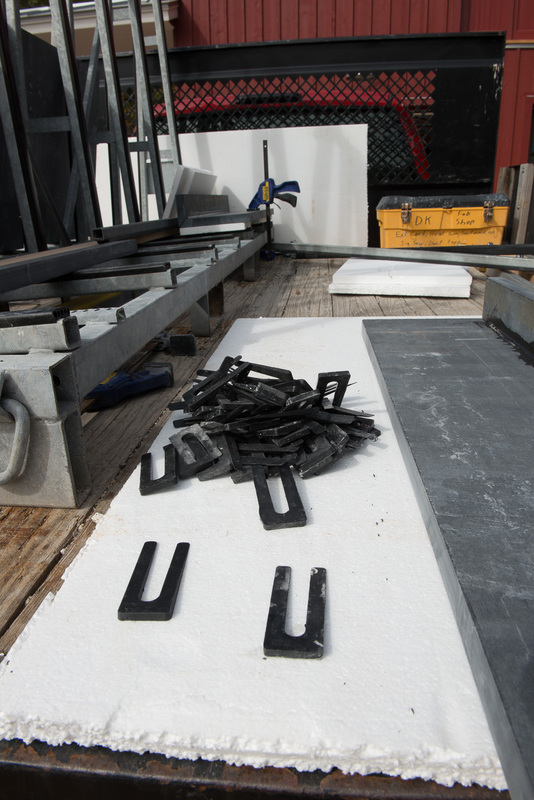 These little shims are used to level the countertops. Apparently they used to use wood shingles, but the weight of the stone would compress the wood too much.